This article will explain some of the SQLCMD script keywords that the Database Engine Query Editor supports. To write or edit SQLCMD scripts in the query editor, the SQLCMD mode needs to be enabled. By default, this mode is turned off. Another way to enable the SQLCMD Mode is by using a combination of keys ALT+Q+M from the keyboard. When using SQLCMD mode the IntelliSense and Transact-SQL debugger are turned off in the Database Engine Query Editor. In the SQLCMD mode, two types of statement can be entered: the first are the SQLCMD and second are T-SQL statements. 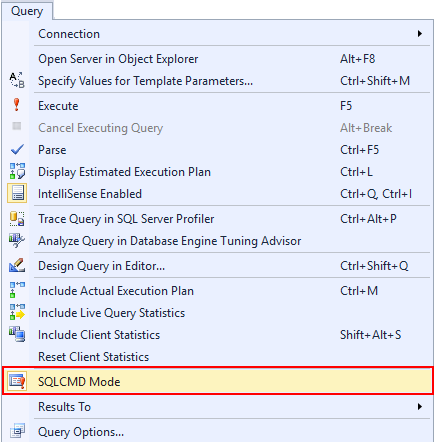 The SQLCMD commands are automatically highlighted in gray and the T-SQL statements appear normal as it appears in the regular query. Most of the SQLCMD commands begin with a colon (:). For a few SQLCMD commands, such as QUIT and EXIT though, a colon (:) can be omitted. For example, the quit command will work the same as the command : quit. This is enabled because of backward compatibility with the osql utility. SQLCMD is very useful when it needs to execute the same code on multiple databases or servers. In the example below, it is shown how a user can be added on multiple databases. Save this code as the User.sql file on this location “C:\User”. sp_grantdbaccess –Stored procedure that adds a user to the current database. This defines sqlcmd variables. The first item is the name of the sqlcmd variable (<var>) and the second item is the value of the sqlcmd variable (<value>). Variable names (<var>) are case insensitive. Redirect all errors that occur during execution to the specified file name, in this case, this will be the Errors.txt file on this location C:\User\”. If this file already exists, the content from the previous session will be truncated. This sqlcmd command reads input from <filename>, in this example, from the User.sql file and loads it into the statement cache. With this sqlcmd command, an action can be set that will be performed when an error occurred. When the ignore option is set, sqlcmd ignores the error and continues to execute the script. Executes the batch, then exit and returns no value.